Rhedae, ‘Chariots’ or ‘Wagons’, was a Visigoth city, either at Limoux 13km northward, or at Rennes le Chateau. This natural citadel with access to groundwater, was a wagon horse grazing station behind Couiza, on the Aude river and land crossroads. The name could be from Regnes, Kingdom in Catalan. A castle and village here was inevitable. A Roman road to Bains passed just north of Rennes, via 14 L’Escale, Stopover Inn. Another passed further south. Amphores, a mosaic, and Republican and Imperial coins of Julius Caesar and Augustus in a waste tip behind Escale ruin, dated since BC60, and indicate colonisation extending to Bains from BC46 (noted Val Wineyard). Rennes le Chateau’s subconscious landscape includes Couiza, and is as complex as in the earlier, adjacent Bains. At Rennes the eternal structure is now identified at several levels of scale: in the church domain (see another post); church floor plan (see another post); and church mural statue group (see another post). The same applies to cities, including Paris and London (Stoneprint Journals 3, 4). Priest Sauniere, like Boudet in neighbouring Bains, unknowingly served the global, subconscious agenda of all cultures, each in different styling. His conscious plans, and his income from selling masses and holy water by post worldwide, were curtailed by an egalitarian bishop in Carcasonne, and by the French Minister of Religion, after his royalist restoration agenda became too daring in an 1885 election sermon. Rennes le Chateau from the air, looking north. Left is the church ground (see Rennes le Chateau church ground, in another post) and church (see Rennes le Chateau church floor plan, in another post). Mid top is the castle. Beyond is a waste landfill. Mid below is the parking and water tower. (Photo: Schmiede des Wissens). Rennes le Chateau area (map after Ecomaison Chez Alice. Type labels and axial grid by E Furter). 1 Builder; Jaffus hamlet, perhaps from Arabic Ja’far, Source (pool). See 15B Peyre Picade, below. 2 Builder; Sarrat of the Rock or Frock, or Plazent, with two ruins (builder). Boudet names it Ulcer, Gound Hill (but see Rennes les Bains stoneprint, type 5b Charbonniere, in another post). 2; Tables or Inn of Wolf, Borde du Loup ruin (canid is more typical of 15). 2; Halo cliff, Auriol. Rennes axis 2 meets Bains axis 2 here. 2c Basket; Coumeilles stream, ‘Buckwheat store’ (container). 3; Maurine, at Captee source (pool). 3; Coume Sourde. See Rennes les Bains stoneprint, type 3, in another post. The two Rennes axes 3 meet here. 3-4; God’s Valley hill, Lavaldieu, a small sharp height with a hamlet on top, probably part of a separate Bains South stoneprint. It had a 1000s chapel of Knights of St John of the Cross….etc…. 4; Labadous pond. (Photo: Armitage). 4 King; Washing, Labadous. Esoteric author Elizabeth van Buuren, daughter of USA president Martin van Buuren, bought the land and built a square (rectangle) fountain (pond) with four (two twins) sitting (squatting) lions (kings) facing inward. Inside was a heart shape (more typical of 12) of rocks, outside a heart shape of 333 roses, half 666, ‘of beast or man, a welcome to aliens in the last days’. At the entrance to Rennes, she placed a Sacred Heart placard, at a track to a supposed Lemurian underground temple, Agartha (more typical of 12)….etc…. 4p; Couleurs cliff 1600s windmill ruin, renovated as ‘Visigoth tower’. (Photo: RegardsDupilat). 4p Galactic South Pole; Couleurs cliff (junction). Windmill ruin of 1600s restored as ‘Visigoth tower’ (armoury, of 12 opposite), by Van Buuren (see 4 above). 4p; Pump source, Pomp (spout). 4p; Trees planted in a V-shape, for supposed ‘UFO ascension’ (5 ascend, judgement) by Van Buuren (see 4 above). 4p; Hole, Aven (juncture), due south of Rennes. Former guest house owner Noel Corbu marked this hole as a treasure site, but see 6 Casteillas below. 4p; Boudous, at Tables or Inn of Balm, Borde d’en Salva. 4p; Four Righteous source, Quatre Ritous, probably emperors (4 king); or royalist priests suspended by the Minister of Religion, Goblet, for preaching politics in the 1885 election: Rennes Abbe Sauniere, Roullens curate Tailhan; Bourriège curate Jean; Alet les Bains vicar Delmas….etc…. 5a Priest; Colours stream, Couleurs (varicoloured). Caves and mines on both banks. A gold statuette was found here (noted Stanley James). In a field in 1860 a 50kg ingot was found, and 20kg of melted Arab coins. 5a PriestB; Sarrat Pelat hill, Soubiros. 5b Priest; Cubic stone, perhaps a model for some artworks, such as Pietro (‘Stone’) Perugino’s Galtzin triptych of St Domenico in St Gimignano (noted De Raaf). He painted Magdalene with her ointment jar (5c container) in the right panel, under a cubic rock, her posture as of the central Mary: arms below belly, fingers forming three X’s (see Rennes le Chateau church floor plan, 11 altar, in another post). 5b; Furnace or Oven Cave, Fournet (of 4), south of the stream, renamed Magdalene Cave (5c container) by Van Buren (see 4 above). Near a stone with a foot hollow and scratched crosses (ritual), now at Magdala Tower, which is visible from the cave…etc…. Wilkinson (aka Hammott) hoaxed (see Rennes le Chateau hoaxes high and low, in another post) a small chest with ‘parchments of Solomon’s key’ in the cave (5c container, texture). 5b; Soubiros village east, cross-paths. 5b Priest B; Receded southern cliff. 5b B; Plateau of White Fort, Sarrat de la Bezu. Gold finds (see Rennes les Bains map, type 4, in another post). 6-7; Mine 1894 with crystal ceiling and mud floor. (Photo: Drawingninja). 6-7; Mine marked 1894, crystal ceiling, mud banks. 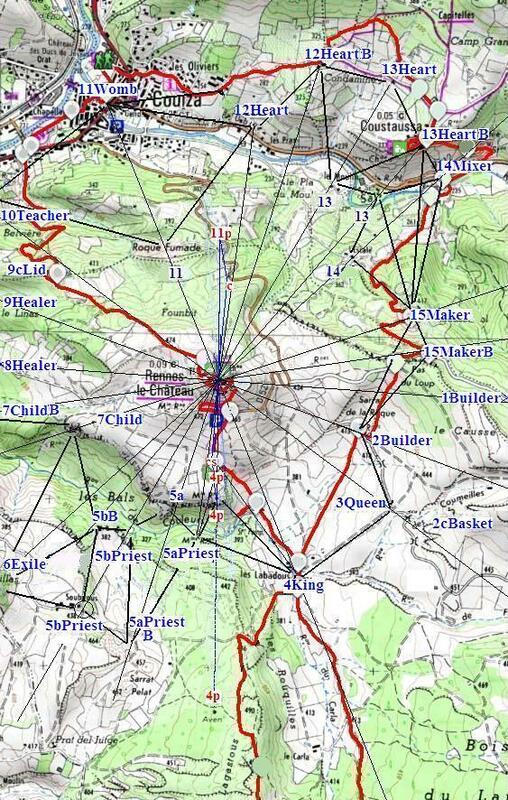 A movie team said they entered 250m “under Rennes hill” (6 ingress). Geology faults tend north-east. 6-7; Pailheres, Haystack, Bed (7 bag). 7 Child; A Bals source. 7 Child B; Campagne les Bains. 8 Healer; Les Estous, hamlet due west or Rennes, east of Linas ridge. On the coast route passing just south of Rennes to Bains. Estous could be from Easter, near the spring equinox, Frenzy in Latin….etc…. 9 Healer; Esperanza north, west of the Aude river. Former southwest part of 10-11 Montazels. Felt hat industry (more typical of 9c). English speakers live here. 9c Lid; Cremation ossuary, 200m long, east-west, skeletons stacked in layers. Revealed (revelation) by work on the new access road 1908. Perhaps Cathar bodies, one of several ossuaries. The Rennes area may have been a cemetery and underworld due to caves, an afterlife Arcadia of Couiza. 10 Teacher; Roman road stage (guard), south of Belviere. 10; Belviere. And Joseph Mountaint. Rennes sunsets 13 Jan and 28 Nov.
10; Pastabrac, Couiza industrial zone south of the Aude. 10-11 Founbit, dinosaur egg nest (11 womb). See Rennes le Chateau church mural, type 4, in another post. 10-11; Montazels, south-west of Couiza. See Rennes le Chateau church mural, type 4, in another post. The Celtic Nemeton gathering (10 council) may have been here, serving 9 Esperanza and 6 Casteillas (see Rennes church mural 2c, in another post). 11; Fumade ruin. (Photo: Gralssuche). 11 Womb; Fumade Rock, ‘Smoked’ (Salted Fish), a Fort and Roque (pronounced Roca) on a small ridge, just north of a track, perhaps a Roman road. Some war and plague victims were dumped here (tomb), perhaps for raptors to clear. 11; Couiza, at the Sals-Aude confluence, formerly navigable. Celtic crossroads market. A Visigoth monastery on higher ground near the confluence about AD400 built a small church, later St John Baptist, starting Couizanum, from Cupitius, Cusius, ‘Lusty’. Oyster shells remain in the river gravel. The church town crest and church window have a Eucharist wafer (wheat) in a grail (11p hour decan Crater. See Types, trumps and hour decans, in another post), on a cross (11p juncture); with a star above and a Paschal lamb below, of the wool industry. These Visigoth monks also started Rennes le Chateau castle in 414, perhaps using Roman loot…etc…. 11; Joyeuse Castle in Couiza, a river ford palace with trapezium courtyard (interior) and moat (water), on a Visigoth foundation with crypts and a tunnel (interior) under the cold room, now silted up. It supplied crops (wheat) to the Crown. See Joyeuse castle, palace of privilege, romance and tragedy, in another post. 11; Place Bistan, ‘Garden’ in Arabic (11 interior), in the centre of Couiza. 11; Ulpian bookshop, named after a Nostradamus verse, perhaps about Rome’s Basilica Ulpia in Trajan’s forum, after his family name, Ulpius. An unidentified temple and niche behind the basilica, completed by Hadrian and his wife, expresses type 11 Womb in Trajan’s Forum (Furter 2016; p354-355). That temple is now under Valentini Palace, between Bakers Guild’s St Mary of Loreto (womb) dome, and Sts Nome and Mary (womb), on Rome’s axis 11p. Above the colonnades were gilded statues including a chariot, ‘From spoils of war’. Rome’s treasury was nearby in Saturn’s temple on the Capital. Visigoths brought Roman loot to Rhedae, ‘Chariots’, c414. Or the verse is about Ulpiana Splendid, a Roman city in Cosovo named for Trajan Ulpius, near silver and lead mines, and a mound grave (grave) of a princess (womb) with a silver treasure of BC200s. A quake in 581 ruined Ulpiana. Nostradamus notes a quake revealing graves in Century 8:66; “When the DM writing is found [his son’s emblem paintings? ], and ancient cellar (cave) with perpetual lamp [9c] discovered; Loy, Roy [4 King] & Prince Ulpian [Trajan’s son?] is proved, Pavilion Royne&Duc under the cover.” (9c)….etc…. 11; Couiza gypsum mine, Encantados. Mining exposed a dolomite cave (interior). Aude counsellors in 1900 entered 500m. Closed 1914, re-opened 1940 by Castel, then by Siau. The Couiza end collapsed on ‘Spanish’ Clement’s men and horse (tomb). 11p Galactic Pole; Olive press, Les Oliviers. Legendary Olivier was a friend of Roland. The name is from Germanic for Alphen Army or Ancestor (12 ancestor). The Latin word means olive. 12 Heart; Les Pras, hamlet on north bank (water-work). 12; Rennes Castle (interior, weapon). Its cemetery is closed off. A water tank passage (water-work) was reopened 1999. 12 Heart B; Condamine, surname linked to Hercules (felid). At Monaco port a statue shows a lion-headed man and siren with a golden apple or heart. Condamine town logo has a lion head, half Fleur de Lys bee, and chapel (13c). 13 Heart; De Lauzi source, perhaps from Almond (tree, of 14). 12; Shepherd’s huts, Capitelles. Top right horizon is Bains 11 Cardou peak. 13; Stone Huts, Capitelles. Round corbelled huts (interior) for shepherds, lambs or bees (of 14), worldwide. 13; Caustaussa Mill, Moulin (water-work), north bank, formerly south, now an old age home, race and bases remain. 13 Heart B; Coustaussa, Custodia, Guardian, castle (bastion) between Bains and Rennes. ‘Farmers’ Generals’ controlled the hated salt tax, gabelle. An old map labels this area Materre, My Land. In the church, the murderer (death) of priest Gelis on 1897 Nov 1, scrawled “Viva angélina,” perhaps for ‘Viva ange linea, lignée des anges, Long live the Angelic Society’. Their nickname was Brouillard, Fog or Mist. 13c Head; Stone circle at New Mill, near old millrace, at a Rialsesse bridge. 13c; Stone well near the river, perhaps a wishing or spells well (oracle), now filled and blocked (lid), noted Val Wineyard. 14 Mixer; Stopover, L’Escale, camp or Inn on the old Roman road; amphorae, mosaic, coins. 14; Water Wheel, Rodier, east part. 14; Cassiopeia Hill, 61 degrees ENE from Rennes St Magdalene, sunrise on her day (time. See Rennes le Chateau church plan, type 14, in another post). 14; Cassaigns. And Bains axis 14. 15B; Wolf Pass, Pas du Loup (canid), on the Coustaussa road north of Sarras. Near fortress ramparts. Of Lupé family, Wolf, of Pilat region. And Bains axis 15. 15B; Peyre Picade, with a source behind Red Plateau, Sarrat Rouge, flowing north to the Rialsesse. Near hamlet Jaffus, Craft Goods (bag). Rennes le Chateau priest Berenger Sauniere made expansive renovations, using unexplained wealth. He failed to start a Magdalenian pilgrimage, and to restore a Habsburg king, but his life raised Rennes legends to popular notice. (Detail from one of his own postcards). Rennes landscape archetypal axial centre is in the village, near the castle, at Dragon of Wheels, ‘Dragon de Rhedae’ restaurant. The centre is analogous to the ecliptic pole, dragon myths, and Draco constellation. Rennes had three churches (polar trio); The castle’s first outer chapel St Mary, later changed to St Magdalene; St Peter (initially St John?) built by Voisins about 1300 in St Peter Street, 60m south of the church (see Rennes le Chateau church ground plan, type 9c, in another post. Coppens 2012. Smith 2018); and the castle’s alter inner chapel, later to St John Baptist. The hill has rifts, water tunnels, boreholes and treasure digs. Midsummer is on road D52 bend (juncture) north of Rennes (see 11p above). Midwinter is on the southern road fork (juncture), at an imagined ‘Roman Tomb’ between Rennes and Couleurs windmill cliff (see 4p above). The celestial polar axle lies nearly north-south (orientation). These markers place summer on axis 12, analogous to Leo, implying spring and the cultural time-frame as Age Taurus1. The Taurus1 time-frame is confirmed by legends of Isis, replaced by Artemis, replaced by St Magdalene. These emblems are analogous to hour decans 15 Sirius, 1 Auriga, 2 Pleiades and 2c Algol, which in turn hosted spring sacrifice and adolescent rites. The archetypal and stellar spring point remains part of type 2 Builder. The celestial spring point moves with Aries ‘sign’, dragging some type 3 Queen myths with it, as it did through Pisces constellation from about BC80 to AD 2016 (Furter 2014). A parchment text noted ‘an Isis temple at Rhedae, renamed Magdala under Titus AD 70’ (Smith 2018). The date reflects destruction of the Jerusalem Temple, and the start of Christian legends. The five structural layers of expression are subconscious to artists, architects, builders and members of any culture. ==Extract from STONEPRINT Journal Series. Supplement to Stoneprint, the human code in art, buildings and cities. Order the book, or journal editions; or contribute articles, on edmondfurter at gmail dot com, or +27 (0)11 955 6732, Four Equators Media, Johannesburg.